After all the rain and winds we have all been experiencing over the past weeks, Sunday dawned clear and sunny: it made such a difference! It was lovely for families just starting their half term holidays. 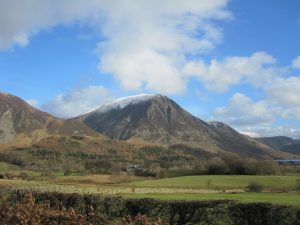 I spend some time in the morning doing some much needed work in the garden and then Wattie and I went for a walk up Mosedale. 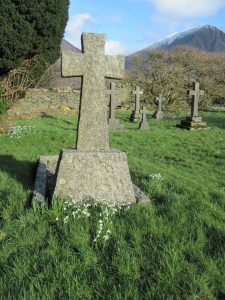 The snowdrops were out in the churchyard and the crocus are almost ready to take over. I enjoy walking up Mosedale, it so very quickly feels very remote and although most of it is a there and back walk the views are different each way! There have been several branches and trees down during the storms although in general I think we have got off very lightly. 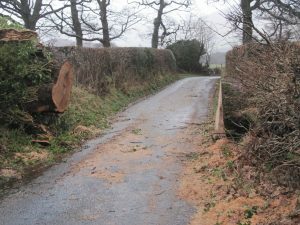 A tree came down just further along the lane and blocked the road. It was soon cleared but initially just to about a car’s width. I was talking to a friend recently who has a long wooded drive to her house. A tree came down and blocked the drive. She was therefore surprised to see the postman arriving in his van: apparently he carries a chain saw in the back of his van to deal with such emergencies! What lengths the postal service will go to to deliver mail! A couple of weeks ago road diversion signs appeared at the Buttermere turn, Lorton and Whinlatter. It was a bit of a puzzle to work out initially what it was all about and where the closure was: the road up Borrowdale was closed is repair by the Watendlath turn as it had collapsed and the diversion is over Honister Pass!! This is for six weeks!